On the overcast and rainy morning of May 10, the ASHG Education Team (Kelly Ventura, Senior Director of Education and Membership; Karen Hanson, Senior Manager, Education Programs; Evelyn Mantegani, Education Coordinator; and myself) headed to Calvin Coolidge Senior High School, a public school in northwest Washington, DC. The school houses an Academy of Health Sciences, which prepares students for college and careers in health-related professions. As ASHG was preparing to move our main offices to a new building, we discovered a lot of new and gently used lab equipment and supplies in our storage room. There were things like a PCR machine, water bath, and DNA gel electrophoresis items. The supplies were previously purchased to facilitate experiments with educators who developed lesson plans for high school students. With no future plans for the supplies, we decided to donate them to a local high school, and identified Coolidge High School with the help of former ASHG Genetics Education and & Engagement Fellow Teresa Ramirez. The day of the visit, Kelly and Karen graciously drove in their monster cars for us to load up and transport the many boxes to the school. We were greeted by Zakiya Edens, Coordinator of the Career Academy. She led us to the Academy of Health Sciences room, where we discussed the science program and its strategy to motivate students to come to class and maintain good grades. Students in this special academy participate in additional classes and programs on top of their regular curriculum to prepare for college. We then met with some academy students, followed by a biology class that was discussing basic genetic concepts and the structure of DNA. Karen and I talked about our roles at ASHG to give the students an idea of career options in the sciences beyond traditional professions like scientist or medical doctor. I shared how they can use their background and love for research to educate scientists and clinicians interested in human genetics. Karen connected to the students by discussing her role as a genetic counselor for the past 25 years and showed them how genetic counselors work with a team of medical professionals to offer the best advice to patients. We enjoyed the experience of chatting with teachers, administrators, and students. We are now working with Coolidge High School to organize a visit from an ASHG Genetics Education Outreach Network (GEON) volunteer member, to help the teachers go through the donated items and plan experiments for the new school year. 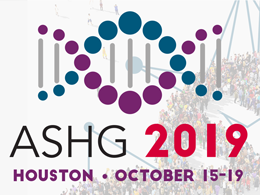 GEON is a network of ASHG members who volunteer their time to assist science teachers in building understanding of human genetics among students and the general public. Kanika Pulliam, PhD, is Senior Manager of Education and Career Development Programs at ASHG. For more on ASHG’s programs for science students, visit our K-12 education website. Happy DNA Day! Every April 25, we commemorate the discovery of DNA’s double helix structure in 1953 and the completion of the Human Genome Project in 2003, two key milestones in genetics. A variety of DNA Day events are taking place worldwide and online, including the debut of our ’15 for 15′ infographics on recent advances in human genetics – check them out! ASHG marks this date each year by announcing the winners of our Annual DNA Day Essay Contest. Open to high school students worldwide, this year’s contest asked students to share their views on whether medical professionals, such as medical geneticists or genetic counselors, should be required for all genetic testing, or if consumers should have direct access to predictive genetic testing. The winning essays were thoughtful and nuanced, reflecting a variety of views and a sophisticated consideration of the issues, and we were excited to see high-quality entries from several countries around the world. We awarded first place to Diane Zhang, a junior at Fox Lane High School in Bedford, N.Y.; second place to Ilan Bocia, a senior at YULA-Boys in Los Angeles, Calif.; and third place to Nadia O’Hara, a freshman at Pechersk School International in Kyiv, Ukraine. For a full list of winners, honorable mentions, and teachers, and to read the winning essays, check out the DNA Day 2018 Winners. Through this contest and our other K-12 initiatives, we hope to encourage young people to explore genetics and inspire the next generation of ASHG members and leaders. Jannine Cody, PhD, Professor of Pediatrics at the University of Texas Health Science Center at San Antonio, is Chair of ASHG’s Information & Education Committee. Learn more about ASHG’s K-12 education programs.